The story revolves around Linghu Chong as he makes a name for himself in the martial arts realm. Linghu Chong (Wallace Huo) is the eldest senior brother of Hua Shan Sect. He has a magnanimous and uninhibited personality that leads him to easily make friends with people from all walks of life. He had mediocre martial arts skills at first, but a chance encounter enables him to master the Dugu Nine Swords Technique. He also obtains a manuscript that holds the secret to the martial arts techniques of various sects which invites the suspicions of his own master (Howie Huang) who banishes him from their school. Linghu Chong is childhood sweethearts with Yue Ling Shan (Yang Rong), his master's daughter. After saving Lin Ping Zhi (Chen Xiao), a young man seeking revenge for his family who was massacred in one night, Linghu Chong is heartbroken to learn that Yue Ling Shan has fallen for him instead. However, Linghu Chong soon meets Ren Ying Ying (Yuan Shan Shan), the young miss from the Evil Sect and he also crosses paths with Dong Fang Bu Bai (Joe Chen). Through their encounters, he begins to realize that his perception of what's right and wrong is not always so straightforward. Linghu Chong marries Ren Ying Ying. When asked about how she got rid of the poison that was killing her, she says that Ping Yi Zhi changed her heart. As it turns out, it was Dong Fang Bu Bai who made the sacrifice by giving her heart to Ren Ying Ying. Dong Fang Bu Bao also told Ping Yi Zhi to bury her deep into the frozen lake after her death and to never tell anyone that he saw her. Meanwhile, Linghu Chong and Ren Ying Ying decide to lead peaceful lives away from everything, but one day, Ren Ying Ying suddenly finds herself feeling sad and drawn to the frozen lake. It premiered February 26, 2013 on Hunan TV. It is produced by Yu Zheng who also writes the screenplay. It is directed by Taiwanese Director Hu Yi Juan and Huang Jun Wen. 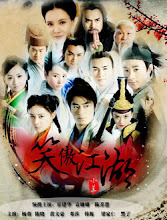 The drama was controversial for the many changes to the storyline which was supposed to be based on the classic novel written by Jin Yong. One such change is that Dong Fang Bu Bai is a woman instead of a man. Let us know why you like Swordsman 2013 in the comments section. Please also share these fun facts using the social media buttons below.